Justice Minister Ayelet Shaked (Jewish home) referred Tuesday at the Jerusalem Conference hosted by Besheva to the US administration’s denial that Israel had discussed with it a proposed legislation for the application of sovereignty in Judea and Samaria. According to Shaked, Israel must act in accordance with its own interests. "Begin did not hold talks with the White House about imposing sovereignty over the Golan. He simply did it. It’s clear that all the countries of the world, as well as the United States, will not accept the application of sovereignty easily." Shaked noted that "This [US] administration is an open-minded one. This is a very courageous president who thinks outside the box, but ultimately the State of Israel must do what is right and good for the State of Israel." In her opinion, the world must internalize that sovereignty is on the way. "We need to see how the various interests of the state are promoted. I repeat that the international community needs to know that we are going to apply sovereignty, even if it takes time." 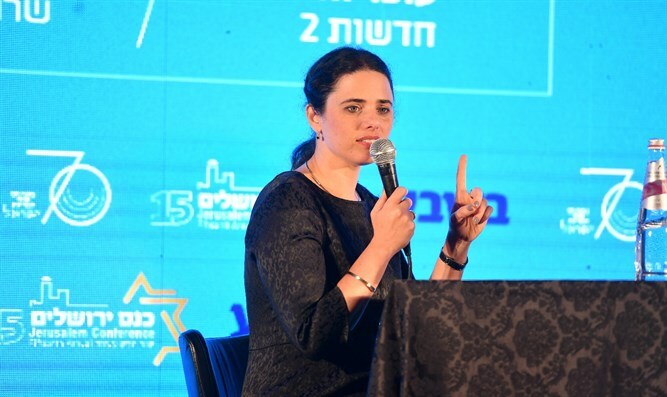 When asked what would happen if the Americans objected to the process of applying sovereignty Shaked replied, "No one deludes himself into thinking they will applaud us for such a step."